Maker's Mark: Winery offering tours in Loretto, Kentucky. Churchill Downs: Horse racing course and home of the Kentucky Derby, located in Louisville, Kentucky. Kentucky Kingdom: Amusement park in Louisville, Kentucky. Newport Aquarium: Aquarium in Newport, Kentucky. Creation Museum: Museum in Petersburg, Kentucky. Keeneland: Race course and sales complex in Lexington, Kentucky. Louisville Zoo: Zoo in Louisville, Kentucky. Red River Gorge: Canyon system on the Red River in east-central Kentucky. Kentucky Horse Park: Horse farm and educational theme park in Lexington, Kentucky. Waverly Hills Sanatorium: Haunted house in Louisville, Kentucky. Lake Cumberland: Reservoir in southern Kentucky. Land Between the Lakes: 170,000 acre of national recreation area in western Kentucky along the Kentucky-Tennessee border. Louisville Slugger Museum: Museum and factory tour in Louisville, Kentucky. Mammoth Cave National Park: National park in central Kentucky. Lost River Cave: Seven-mile cave system in Bowling Green, Kentucky. Beech Bend Park: Amusement park in Bowling Green, Kentucky. Buffalo Trace Distillery: Distillery in Frankfort, Kentucky. Muhammad Ali Center: Museum dedicated to the life of Muhammad Ali, located in Louisville, Kentucky. National Corvette Museum: Museum showcasing Chevrolet Corvettes, located in Bowling Green, Kentucky. - The Wyandots called it "Kah-ten-tah-teh," meaning "Fair Land of Tomorrow." - The Shawnee name is "Kain-tuck-ee," meaning "At the Head Of The River." - The Mohawks called it "Kentucke," meaning "Among the Meadows." 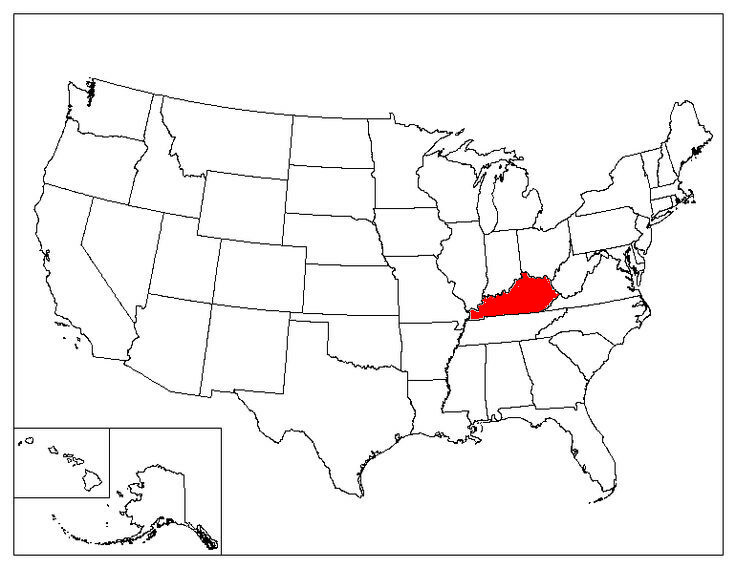 - The Delawares also called it "Kentucke," which means "Place of the Meadows." - The Catawbas called it "Kentucke" as well, meaning, "The Prairie, or Barrens." Held every year since 1875, the Kentucky Derby is the oldest continuously held horse race in the country. In 1774, Ford Harrod (now Harrodsburg) was established as the first permanent settlement in the Kentucky region. It was named after James Harrod, who led the construction efforts. Cumberland Falls in Kentucky is only place in Western Hemisphere to spot a moonbow on a regular basis (a moonbow is a rainbow made from light reflected off of the moon at night). Kentucky�s officeholders and judges must swear an oath before taking office that they have neither fought a duel with deadly weapons nor aided or assisted any person fighting one. 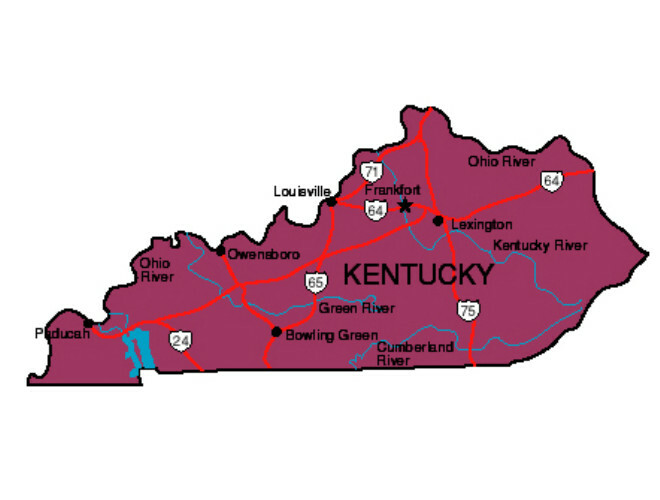 Kentucky is the only U.S. state to have a continuous border of rivers running along three of its sides�the Mississippi River to the west, the Ohio River to the north, and the Big Sandy River and Tug Fork to the east. On January 30, 1900, Kentucky Governor William Goebel was assassinated in downtown Frankfort. Goebel is the only governor of a U.S. state to have been assassinated while in office. The song "Happy Birthday to You" was the creation of two Louisville sisters, Patty Hill and Mildred J. Hill, in 1893. In Kentucky, throwing eggs at a public speaker may result in one year in prison.